Theia Senior Solutions CEO Joanna Gordon Martin accepted the award for “Best Concierge/Specialist Services Firm” at the Annual Family Wealth Report Awards Gala on March 20. With her are, at left, Jamie McLaughlin, CEO of J.H. 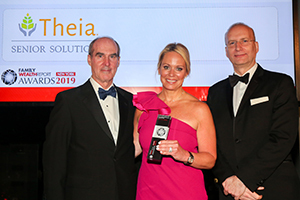 McLaughlin & Co., and Stephen Harris, managing director of ClearView Financial Media Ltd.
Theia Senior Solutions Founder & CEO Joanna Gordon Martin expressed her gratitude to FWR, and her team at Theia, after accepting the award at the Mandarin Oriental in New York City on March 20. Theia helps clients navigate a fragmented healthcare system, serving as a single point of contact that provides families with access to the best resources for aging loved ones. Services include attending medical appointments, securing second opinions, home check-ins, hospital discharge planning, help with Medicare and long-term insurance benefits claim management, end-of life planning, and more. The Family Wealth Report Awards showcase the best providers in global private banking, wealth management and trusted advisor communities. The awards recognized companies, teams and individuals judged to have demonstrated innovation and excellence during 2018.